Learn How to Boost Your Website Traffic and Sales in Google in an Easy Step-by-Step Format From an SEO Expert with 19 Years of Experience in the Industry. When you know what it takes to position your website in the top of Google search results, you have gained a major competitive advantage compared to your competitors, who may blow all their money on pay-per-click or other expensive internet Marketing strategies that can cost them a fortune. Using intelligent Search Engine Optimization strategies can generate lots of targeted traffic to your website if you know what you are doing. Just look at the small case study below for one of our clients and you can see how SEO still works in real life. This client is in the language translation and localization industry. The total amount of real inquiries were really low and the conversion rate was very poor. 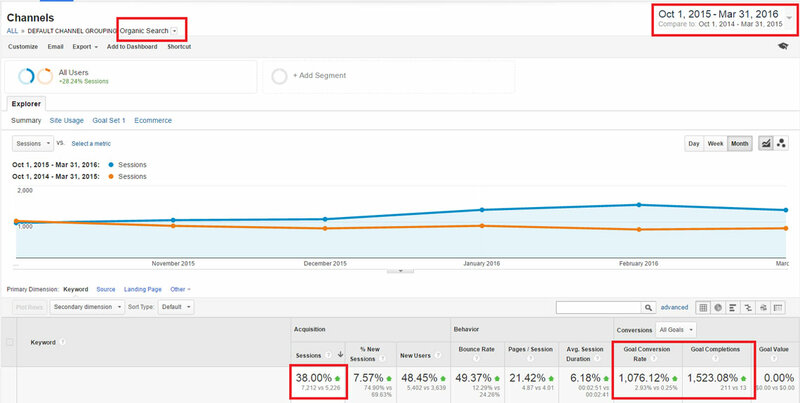 However, initially when we started, the client received around 1,000 visitors/per month on average from organic traffic but their conversion rate was only 0.25% (see screenshot below). This obviously sent us clear signals that we needed to change their SEO strategy and targeting methods. For example, before we started, their content was too generic with a clear lack of focus and it clearly did not appeal to their target market. They did rank for certain generic keywords, but they were too generic to convert. In addition, certain generic keywords were not intended for their target market but more for users looking for online and machine translation. Google preferred other categories of websites on the search result pages (SERPs) for those queries they tried to rank for. It was no wonder why they had such poor conversion rate. They lacked many on-site issues on all their landing pages, which had to completely be re-done. We restructured their entire SEO strategy in regards to target and personas of their audience. First the content and in-depth keyword approach was rewamped by using long tail keywords trying to bring in many targeted and long tail keywords in the top of Google’s SERP. In addition more focus was placed on ranking “money making keywords” which are keywords more inclined to convert into real clients. We also helped boosting their domain authority further by using high quality back link building. The combination above along with fixing other on-site issues really helped in boosting the conversion rate, the amount of conversions and organic traffic for this client. This client is in the dental industry. Initially when we started the client had little conversions from organic search in Google. Initially the client only received 34 inquiries and 2,181 organic visitors in the period of Jan 1-Jan 31st 2015 and conversion rate was 1.34%. The client’s website looked old and disorganized, but also had lots of SEO issues in terms of urls, content, canonical issues, keyword approach. We revamped the client’s website completely and restructured the website using better SEO structure and silo, generated more targeted content, better cross linking, wrote laser targeted articles for their target audience, built high quality back links from relevant and high authority websites. This client is a local client in the Rehab industry. Before Marketing Ignite took on the project in May 2015, the client received very little traffic from organic search in Google. The client’s lead conversions from Google (organic traffic sources) were very limited. Initially the client only received 309 organic visitors and 10 inquiries/month (May 1st – May 31st, 2015). See screenshot below. Obviously more work needed to get done to boost the amount of organic traffic and conversions. Marketing Ignite re-structured the SEO strategy, making the client’s site more SEO friendly and worked on a number of SEO elements such as doing an in-depth competitive analysis to formulate a winning attack plan for the client with a main focus on boosting domain authority. The urls were vague and not targeted. The overall SEO silo and structure was redone from scratch. Because this client was a local client, more emphasis was built to target high quality and local back links to become more relevant for Google in the local search results. Targeted articles (on-site and off-site) were written and posted in order to gain more momentum in the organic traffic. Because we don’t want to waste your time on theoretical jargon, we will instead teach you intelligent SEO strategies based on 19 years of experience that Marketing Ignite uses to deliver top rankings and traffic in Google. These SEO strategies are the same step-by-step and up-to-date practical approaches that we use for big corporate clients. But because we know that you may not have a “corporate budget”, you will gain access to this at a fraction of the cost. Not only will you learn how to gain top placements for competitive keyword phrases, but you will also learn how to convert more with your search engine optimization efforts. Many companies focus only on getting top placements, but if there is no conversion, it is all a waste of time (except for branding purposes). You can learn online from the comfort of your own home at your own pace. More importantly, it’s designed so that anyone with basic computer skills can learn in depth of important SEO practices that hold true in today’s SEO industry. The training starts out with the more fundamental search engine optimization concepts to ensure that everyone will properly understand the process from the beginning. It then moves forward to more advanced Search Engine Optimization practices, which are necessary to gain higher placements in Google. Once you have gone through all the modules, you will be very knowledgeable, understand the process, as well as be able to position your website in the top of Google. The strategies that you learn are White Hat, meaning they abide by the search engine guidelines. This training course is applicable for webmasters, business owners, affiliate marketers, bloggers, IT students, and basically anyone interested in learning how to gain top placements and traffic from Google. Johan Hedin, the Managing Director at Marketing Ignite Co. Ltd and his team have spent tens of thousands of hours in research, tests and quality control in order to develop an easy to understand Training Course in SEO that teaches anyone in-depth and the process of getting top placements in Google. He has a B.B.A and M.B.A in Marketing from the United States and has worked with the biggest affiliate internet Marketing companies on the web such as ‘Commission Junction/ValueClick Inc’ and other internet marketing companies. He has “lived and breathed” search engine optimization and internet Marketing since 1998 with a passion for helping businesses succeed online. In 1999 he started his own Internet Marketing Company and quickly learned the process of gaining top rankings in Google. He is also often a speaker at internet marketing conferences and he has been producing and distributing ebooks, memberships and other digital products online for many years. Johan and his team at Marketing Ignite have positioned thousands of competitive keywords in the top of Google’s search results for small, medium and corporate clients and have continuously stayed in the forefront of search engine technology. – If you are a newcomer, this module will help you to explore the world of search engine optimization. The definition of “search engine optimization” and how it can drive massive traffic to your websites. Pull back the curtains and see what is behind the search engine results page (SERP’s). Interesting SEO statistics and true facts that will help you to put your SEO campaigns on steroids! Have you ever asked yourself how do search engines work? Or what do they ask from your website in order to rank it in the top rankings? In this section, we’re going to shed some light on the subject and finally you will discover how you can get it right from the very beginning. How SEO has evolved during the past years (this is amazing information that very few know!). How unethical black-hat SEO methods can be the end of any website even before it gets started! Here, you will learn all of the negative consequences and how to avoid them! Why white-hat SEO is always the way to go. If you use it correctly, unlimited benefits are waiting for you! – In this module, you can learn how to nail it from the very beginning. This is going to be the blueprint for your success! The proper way to create a rock-solid SEO campaign from scratch (if you get this right, you will need little else to have a privileged position in the search engine results page). Keyword research to the max! Did you know that keywords are the new gold of the Internet? Researching and getting a profitable keyword means money in the bank! Leverage the power of keyword tools and let them do the hard work for you. In this section, I show you exactly how I use the most advanced keyword tools to harvest unlimited profitable keywords. How to legally spy on your competitors, so you can outrank them later and Effective techniques to quickly determine rank based upon your competition analysis (as I told you, there are thousands of competitors looking after high rankings, but if you follow this section to the letter, it won’t be a problem). Discover the most solid and profitable keywords by using proven keyword research methods. How should you build your website? Learn how to create the perfect structure for your website so search engines will elevate your site to the sky! – Everything starts out from here. Learn a bullet-proof way to impress Google and other search engines. Discover the definition of “TAG” and why search engines are following it religiously (it is no secret that if you are exploiting the power of tags, then search engines will never ignore your site). The importance of meta-tags for search engines, and how you can use this concept to improve visibility in the SERPs. The PROPER and CORRECT way to put everything together (title, description and meta-tags) so big G and other search engines will always pick your site for their top rankings. – Content will play a big role in how your website will be indexed and positioned. How to retain good practices and discard bad ones when optimizing your content (this can make or break your website and its potential). Heading tags can save your life. We do an in depth analysis of the impact of heading tags in search engines. Keyword density and word count is something that can’t be taken lightly. This is very relevant when search engine spiders look at your website. Techniques to improve your image optimization to gain weight in Google’s and Yahoo’s image search (this can drive extra traffic to your websites). Advances cross-linking optimization techniques to boost visibility in search engines (learn how you can be more relevant to search engines and to your loyal visitors). How you can make the job of accessing your website easier for search engine spiders (Google is going to love you for this). Anchor text link is something that is critical when it comes to the ranking process. In this section you are going to learn how to optimize it properly. Do you want to find out how Google “sees” your website? You can now discover the process and check if your website content is properly indexed in Google’s database. Internal site navigation linking (quickly learn the numerous forms of structural navigation options and how you can make your website even more relevant to search engines). Google’s Page Rank Exposed: learn absolutely everything you need to know (history, importance, etc.). Best practices for Google Page Rank sculpting (hoarding) and important data that you should know! Learn why optimizing your URLs to make them more search engine friendly is a good move. Why duplicated (dynamic) content can hurt your rankings. All the negative implications are revealed here in an easy-to-understand manner. You can now standardize your URLs for optimal search engine performance. Plus, easy to follow step-by-step instructions on how you should resolve your duplicate content issues (htacess, canonicalization, canonical links elements, etc.). Learn everything you need to know about the myths and facts surrounding duplicated content issues. There is a lot of confusion out there regarding this important topic, and you are about to finally discover the truth! – Once you have completed all of your on-site optimization, you will need to start looking in other directions, and this module will provide you with all of the necessary tools! Elemental link building techniques explained: everything is covered here, from how the search engines place value on links, to key metrics). The definition of an “authority site”, the qualities it possesses and how it works, so that you can later create your own authority site (Google loves trusted websites so wouldn’t it be a great idea to create one?). Important facts on establishing your website as an expert in a search engine’s eyes, and how it can positively affect your rankings. Why link building is relevant to all this, and how to establish it. Proper link positioning on web pages – discover which links are the ones that count for search engines. How to put ourselves in a search engines’ shoes in regards to link value and relevancy. The importance and magnitude of gaining top rankings for all your internal web pages. Effective deep linking strategies are revealed, as well as how to protect your content from heartless spammers. The do’s and don’ts of the best practices for Anchor linking. – Don’t commit these mistakes that can spoil everything. Learning how to avoid these costly errors will help you tremendously! How to avoid connections from bad neighborhood community websites that have been banned and silenced by Google. In this section, you’re going to learn how to identify the dangerous characteristics of this type of website and protect yourself from being a part of it. Why link farms (FFA sites) are something that you should avoid. Learn how to spot, indentify, and find out what kind of IP network they form together, and how to stay miles away from them! Dangerous link building strategies that you should not even consider (some SEO companies partake in these activities). The relevancy of link exchange in today’s SEO industry. Implications of the little known technique of three-way link building. Everything you need to know about automated link building practices in blogs/forums and automated submission to search engines and directories. How to find high quality back links when executing the link building process (nobody else provides this information). Unleash the power of link baiting and strategies on how to gain back links naturally (without begging for it). How to create content and publish it on other websites in order to gain powerful, high-quality back links that will boost your site to top positions (also several good practices on how to improve your articles so that you gain more relevancy for search engines). If you have the budget, there are a lot of “paid back links”. I will show you the best and safest paid options you can find on the market. Also, I will reveal what you should avoid in order to prevent your domain from being penalized by search engines. Prepare that squeezer! In this section you’re going to discover how to make your back links pass more link juice! Also, important directory quality control factors that are critical components in passing on link juice are presented. Everything you need to know about directories and how they can help you in your business. Top performing submission and optimization techniques to correctly exploit your directory listing (containing a Yahoo directory submission example). There will be a large volume of competitors out there, but, with the right guidance of this module you won’t have to fear anything! Competitive Research Analysis – Legally “spy” on your competitors to find out what they are doing and what their marketing strategies are. How to use free link competitive tools to your advantage to extract valuable and intelligent back link data. Understand important considerations regarding competitive back links (pros and cons). Learn how to measure web traffic and the popularity of a website using free tools (really useful if you are checking your competition, setting benchmarks, etc. or even for back link advertising purposes!). Free traffic popularity tools that you should use. Everything here is explained in a simple fashion, so you can learn how to use these free tools to your advantage in no time. – If you have traffic, you need to know everything about it. Where it comes from, how many minutes they stay, etc. This module covers everything about web analytics! I will explain the number one reason why web metrics are the key factor for success in your business, and how to interpret them to make timely and beneficial decisions. There is a huge base of web analytics options out there and this part of the module is going to discuss which are the best ones, and those which you should avoid. Quickly learn how to compliment a ranking report with your web analytics program to take your SEO campaign to the next level! Effective strategies to improve, measure, and track success in your search engine optimization campaign from a global perspective as well as other Internet marketing initiatives. The complete step-by-step 12 Training Modules to The Professional’s Training Course in SEO in an easy to understand format (see above what each module includes). Once complete, you will know the systematic approach and how to position websites in the top of Google’s search results.